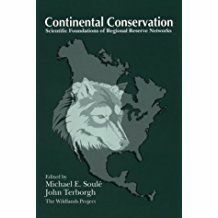 In addition to Soulè and Terborgh, contributors include many of the leading conservation biologists in the world: Hector Arita, Diane Boyd-Heger, Eric Dinerstein, Rudolfo Dirzo, Dan Doak, Andy Dobson, James A. Estes, Mercedes Foster, Steve Gatewood, Barrie Gilbert, Michael Gilpin, Martha Groom, Deborah B. Jensen, David Johns, Richard L. Knight, Carlos Martinez del Rio, Dave Mattson, Brian J. Miller, L. Scott Mills, Lisa Mills, Elliott A. Norse, Reed F. Noss, Paul Paquet, Katherine Ralls, Sadie Ryan, J. Michael Scott, Daniel Simberloff, and Steve Trombulak. Continental Conservation is scientifically solid but is also readable and understandable for the nonscientist. The Rewilding Institute is honored to offer Continental Conservation for sale directly through our website. $29.00 postpaid from The Rewilding Institute. Island Press, 1999.